Trainer Daniel Bowen thinks his in-form gelding Almas can end his current campaign with another win on his home track at Lismore on Tuesday but won't be surprised if talented stablemate Queen Of Kingston kicks off her preparation with a slashing first-up performance. Both Bowen gallopers will step out in the Lismore & District Workers Club Benchmark 66 Hcp (1200m), race three on the seven-race program. Almas has been in great form for the stable in recent months, winning three straight races between May and July. He broke through to win his Maiden at Grafton on May 28, stepped up to win a Class 2 at Lismore on June 18, then completed a hat-trick by winning a Class 3 Hcp at Grafton on July 5. Bowen took Almas to Brisbane for his most recent outing where he finished sixth behind Happy Hooves in a Class 3 Plate (1200m) at Doomben on July 28. "He just got too far back at Doomben last time and you just can't do that on that track at the moment, especially carrying the 58.5kg he had that day," Bowen said. "Back here to Lismore on Tuesday we just have to walk him over the road to the track and he should be hard to beat. "He'll go for a spell after Tuesday's race. He's done a great job this prep and it's usually a pretty good sign that a horse has ability when they can win again straight after winning their Maiden. I think he's a horse who next year can progress through to Open company. Almas makes it three in a row at Grafton. Credit: Darren Winningham. "He was a bit unlucky not to have broken through for his first win much earlier than he did. I took him to Ballina last year and he ran into Whypeeo, that smart horse trained by Toby Edmonds who was having its first start. That horse has really gone on with it and has won Listed races. "And then at his following start at Lismore Almas then ran into Freddie Fox Trot in a Maiden." Freddie Fox Trot, trained on the Gold Coast by Les Kelly, won another three races after his Lismore win, including one at Doomben. Bowen is looking for a bold first-up run from Queen Of Kingston in Tuesday's race as she heads towards the $65,000 Ballina Cup (1600m) on September 6 and the $30,000 Rousillon Hcp (1516m) at Lismore on September 20. 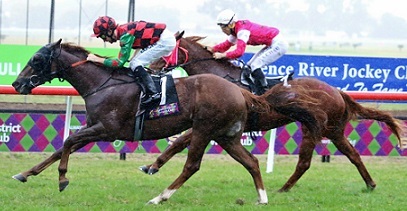 Queen Of Kingston is resuming since early June when she posted back-to-back wins at Lismore - a runaway 7.5 lengths win in a Class 2 (1516m) on May 19 and another Class 2 win over 1400m on June 2. "I wanted to get her ready for the Ballina Cup and the Rousillon so backed off and gave her a break after she put those two wins together," said Bowen. "I'd have to favour Almas over the 1200m but the mare (Queen Of Kingston) could win first-up just on sheer ability. But it all depends on how she jumps as she has had a tendency to be slowly away." A five-year-old daughter of Nicconi, Queen Of Kingston has been lightly raced, so far winning three of her eight starts. She has won two of her three starts at Lismore, her one defeat coming on a heavy10 track back on April 24. One of the hardest to beat for the Bowen pair in the Benchmark 66 looks to be Bancroft from the Matt Dunn stable. A two-time Lismore winner, Bancroft goes into the race second-up after resuming for a third in a Class 5 (1200m) at Beaudesert on July 28. View the fields and form (including race replays) for Tuesday's Lismore meeting here.